A classy attacking display from Morpeth Town ensured three routine points at Billingham Synthonia as Mark Davison’s hat-trick helped the side at the top of Division One outclassed their struggling hosts. The Highwaymen eased to victory as they inflicted league defeat number 21 on struggling Billingham, who had plenty of effort and endeavour but little cutting edge. Ben Sayer and Joe Walton capitalised on a strong Morpeth start to put the visitors two-up inside 21 minutes. A similar beginning to the second half put Town four to the good within seven minutes of the restart; Davison and Sean Taylor finding the back of the net before the former scored a second on 63 minutes and added a third in stoppage time. Morpeth opened the scoring after 12 minutes when Sayer found the bottom corner. The Highwaymen doubled their advantage nine minutes later with Walton rolling the ball into an empty net. Morpeth entered half-time with a comfortable lead, and they duly extended that just four minutes into the second period through Davison’s tap-in after Walton’s effort hit the post. Three minutes later and Town were 4-0 ahead thanks to a moment of magic from Taylor when he turned a defender and sent the keeper the wrong way. 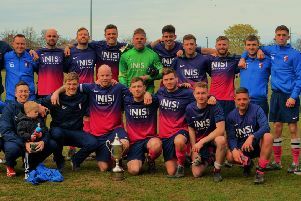 They added to their lead on 63 minutes through the unmarked Davison, who completed his hat-trick by deflecting a corner into the back of the net in the 90th minute.